"Free air for all free men." 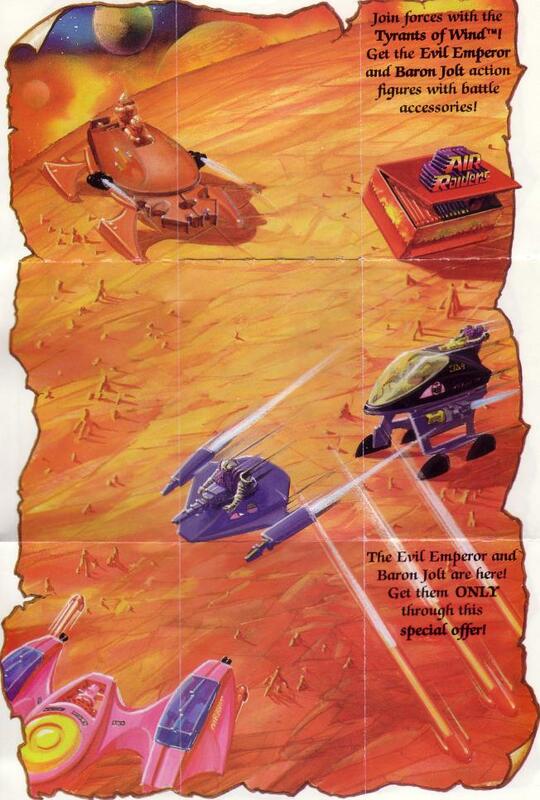 Air Raiders Battle Squad: Heroic freedom fighters. Determined to rid Airlandia of the evil emperor and the Tyrants of Wind and make air free again. Gallant rebels. Always ready to help those in need, whatever the circumstance. Sabotage, demolition and raiding experts. Less equipped than their Tyrant enemies. Specially trained. 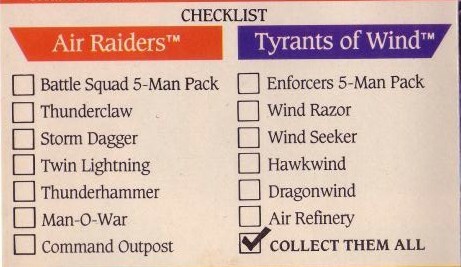 Critical to the Air Raider cause. Carry free breeze blasters that crystallize targets on contact. Led by Leiutenant Noble, a fearless, dedicated fighter. Crew: Manned by Jasun and Con, two dedicated soldiers. Specially trianed to place mission objectives above personal safety. Possess lightning-fast reflexes and great courage. Performance: Highly-maneuverable--can achieve air speed of Mach 2 in 18 seconds. Onboard Specifications: Eqiupped with magnetic anamoly detectors that home in on deposits of galvanized air. Front-mounted blast-resistant raider claw clamps onto enemy vessels for boarding air cargo ships. "Storm Dagger strikes swiftly, silently and sure." Crew: Hook and Fitz. Two-man crew performs 48-hour survelliance missions. Endurance tested before in-house flight assignments. Trained to withstand severe hardships. Vehicle Type: High-speed hoversail--Tandem, two-seat fast attack hovercraft. Powerplant: Air cannon-activated, single 21,000 ERG, vectored-thrust turbo-fan. Performance: Maximum speed of 120 knots. Remains aloft for hours: undetectable in glider mode. Armanent: 2 offensive, long-range air-torpedoes loaded with specialty airs. Equipped with reare freeze breeze cannon. Crew: Commander Airlocke and Buck. Tough, tenacious fliers. Former daredevil airmen. Brash, daring fighters with superior flying skills. Vehicle Type: Advanced F-1 Spitfire---Tactical offensive fighter plane. Powerplant: Air blaster-activated, reverse-thrust capacitors. Performance: Exceptional strategic maneuverability, even in adverse weather conditions. Maximum speed: Mach 2. Armanent: Equipped with air-powered heat-sensitive sprinter missles. Front and rear mounted whirlwind rocket launchers shoot high-impact missles filled with highly-corrosive winds of destruction. Onboard Specifications: Internal weapons relaoder automatically injects new missles into launcher silos for rapid firiing. Also equipped with galvanic air collectors and a built-in-remote-control guidance system for automatic piloting. "Nothing stands in the way of Thunderhammer!" Crew: Four men crew. Dedicated warriors. Specially trained for perilous missions. 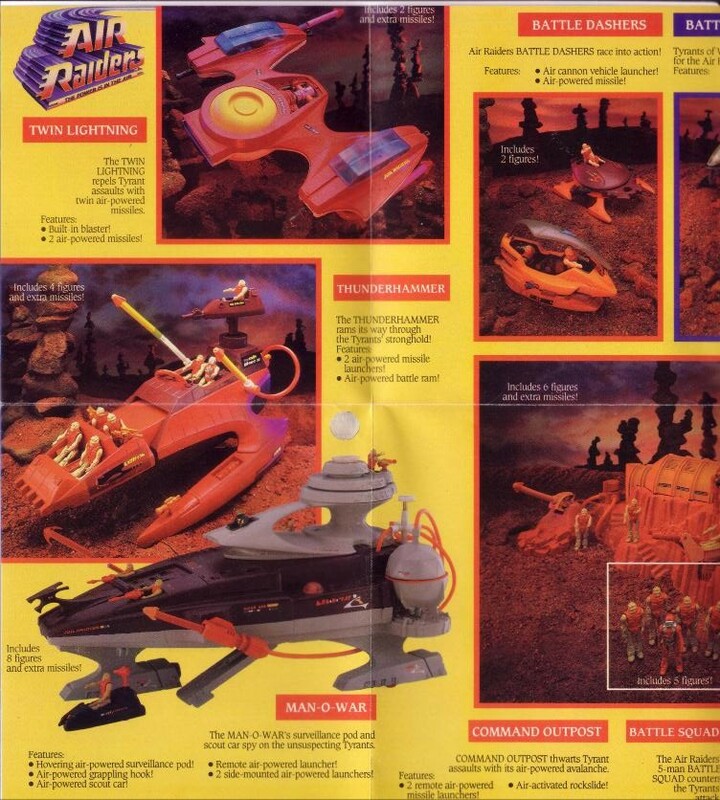 Led by Field Commander Jad, a former daredevil pilot. Specializes in guerilla warfare. Vehicle Type: Battle Ram--amored mobile assault craft. Armanent: Weapons payload of 2 cyclonic air blaster missles and 4 swivel-mounted air cannons that fire 200 pounds per second. Onboard Specifications: Front-mounted battle ram tears through enemy fortifications. Electronic survelliance pod pinpoints enemy installations for offensive assault tactics. Rear-mounted hurrican cannon fires concentrated burst of highly-volatile galvanized air. "Give us free air or give us death." Outpost Assault Team: Highly-trained, top-notch fighters. Not afraid to take chances. Responsible for AIr Raiders operations within Empire perimeter. Commanded by General Rokk, a tenacious fighter determined to defeat the Tyrants through sustained tactical manuevering. Type: Outpost installation--tactical defense fortress. Powerplant: Air-storing, turbine driven air dynamos with 77,000 ERG's of power. Performance: Seals itself from outside assaults with computer-activated armored hatches. Equipped with underground exacpe routes--fortress subchambers are filled with miles of maze-like caverns. Armanent: 2 remote launchers fire air compacter and long range twister rockets. Movement-sensitive, air-powered rockslide avalanche crushes enemy forces. Tyrants of Wind Enforcers: A crack formation of barbaric, cold-blooded figthers. Brainwashed, emotionless marauders. Incapable of disobeying orders. Responsible for taxation, repression and law enforecment on Airlandia. Enjoy pillaging countryside, ravaging wind farms and enslaving innnocent citizens. Led by Lieutenant Ratt, a ruthless master of brutality. Specially-textured combat suits are stress-tested to withstand indirect concussive blasts. Suits are computerized and thermo-insulated. Built-in air canister housing units provide 2-day supply of air. 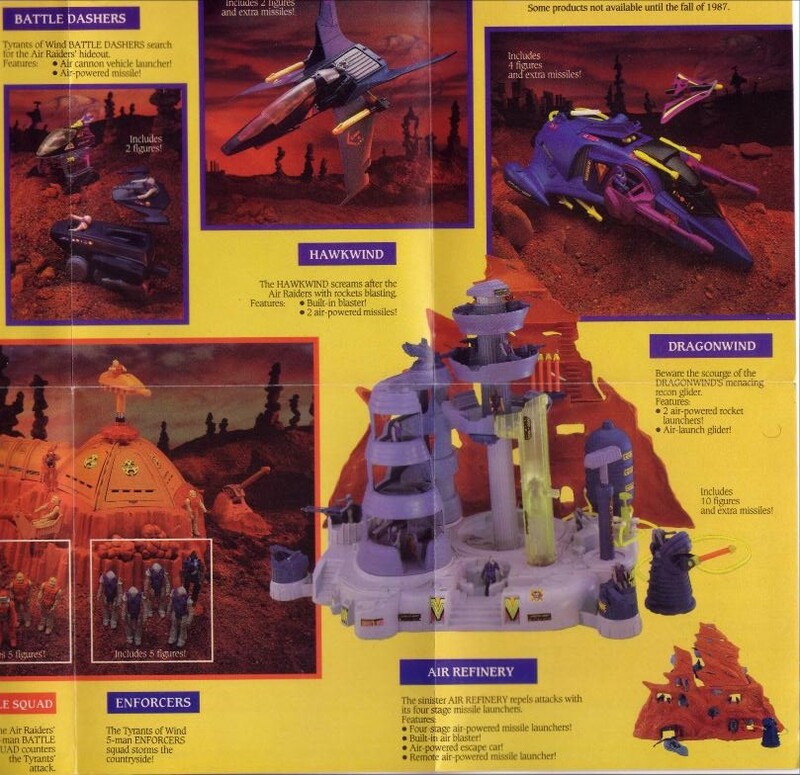 "Wind Seeker's slices through air like a knife." Crew: Sergeant Razorback and Private Dak. Trained to search out and destroy all who oppose. Vehicle Type: Land speedor assault vehicle---Two-seat dual-mode phantom fighter. Powerplant: Air cannon-activated, turbo-propped, galvanized air foil. Performance: Can achieve maximum speed of 200 knots on stabilized jet stream. Armanent: Pivoting rear freeze breeze cannon. Onboard Specifications: Hinged contours allow vehicle to sink low for concealment or rise high for fast attacks. "Wind Seeker's always on the prowl." Crew: Master Sergeant Blot and Private Blight. Two of the meanest soldiers in the Emperor's legions. Huge, muscular brutes. Brainwashed. Incapable of showing emotion. Vehicle Type: Class II reconnaissance vehicle--Two-seat patrol module. Powerplant: Dual, air cannon-activated, fan-engined "Galvanizers"
Performance: Maximum speed of Mach 2. Range: 700 miles. Attains maximum speed only over flat terrain. Rugged territory inhibits maneuverability and performance. Armanent: Twin air hammer cannons can be programmed with long range lock target guidance systems. Onboard Specifications: Fires carrier-borne recond hovercraft equipped with electro-optical surveillance sensors and freeze breeze cannons. "Hawkwind screams through the sky." Crew: Two-man crew--Commodore Kronax and Mace. Rutheless, conceited men. Enjoy shooting at wind farms for target practice. Infamous for their severe hatred of Air Raiders. Vehicle Type: Subsonic attack jet--long-range strategic fighter plane. Powerplant: Air blaster-activated, rocket racer engines. Performance: The fastest and deadliest thing in the air. Reaches Mach 3 in 50.07 seconds. Possesses exceptional maneuverability. Armanent: Rear-mounted rocket launcher fires bluster bombs that produce screeching gail force winds and temporarily disorientate the enemy. Front-mounted, light-sensitive, air-launch whistler missles fire in tandem and explode on impact. Onboard Specifications: Capable of leveling an entire grid on the map in 5 minutes. Four-spread wing design enables plane to fly upside down or sideways. No known weaknesses. "Beware the deadly scoure of the Dragonwind." Crew: Piloted by Commodore Dregs and 3-man crew. Villainous, relentless fighters. Possess insatiable desire to conquer and destroy. Responsible for policy enforcement and interrogation. Vehicle Type: Class 1 Air Striker-Mobile battle bomber. Powerplant: Air plunger activated, static thrust, subsonic boosters. Performance: Can reach Mach 2 in 70 seconds. Capable of hovering up to 20 feet above ground for short periods of time. Armanent: Dual, side-mounted cyclonic cannons that fire in tandem. Also equipped with radar-directed, air-launch glider that can be mounted with high-intensity explosives. Capable of firing 4 independent bluster bombs that relase concussive bursts of galvanized air. Onboard Specifications: Two-man, air-launch reconnaissance glider with built-in guidance system is undetectable in the air. 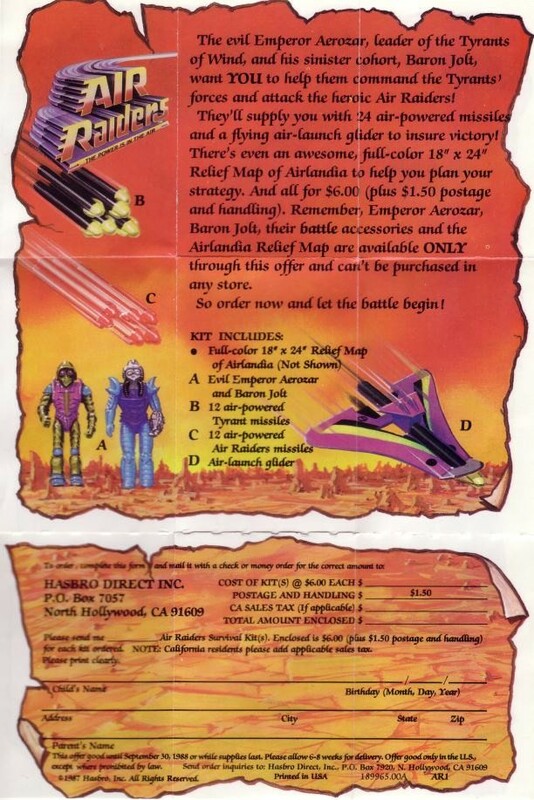 The following is the mail-in form for the extremely rare Air Raiders kit, which included 24 air-powered missles and a flying air-launch glider, the Evil Emperor Aerozar and Baron Jolt action figures with battle accessories, along with a full-color 18" x 24" Relief Map of Airlandia!